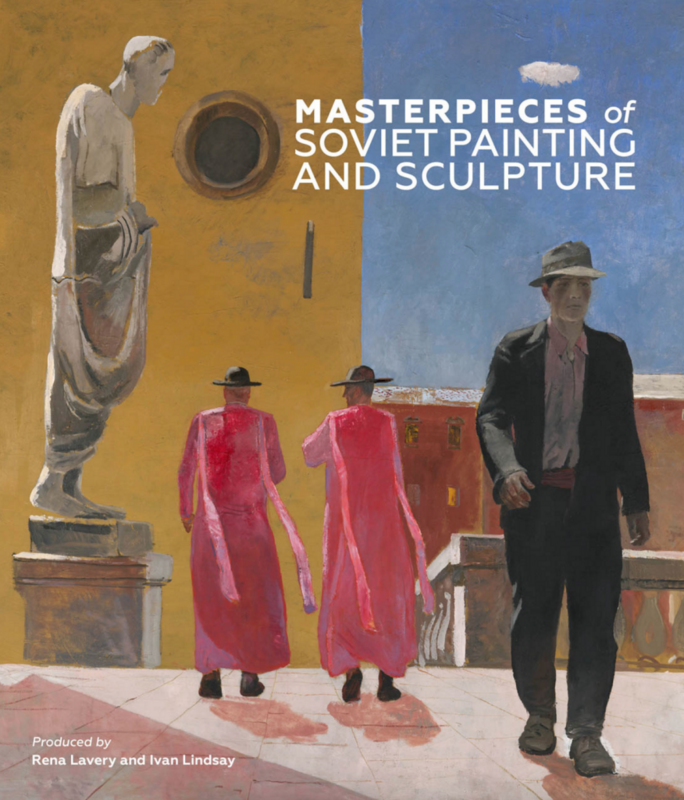 This handsome volume has the purpose of bringing to prominence the works of some of the greatest Soviet artists and sculptors active from the ‘20s to the ‘90s. This is a startlingly broad remit, even for a volume pushing 400 pages in length, and though occasional opportunities for further expansion on certain themes are missed, it is to the credit of editors Rena Lavery and Ivan Lindsay that they cover as much ground as they do, and in such style. 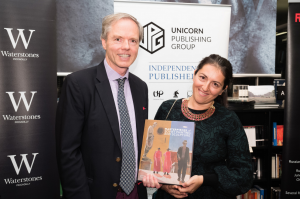 ‘Masterpieces of Soviet painting and sculpture,’ Unicorn Press, London, English and Russian language editions, hardback, September 2016, edited by Rena Lavery and Ivan Lindsay. 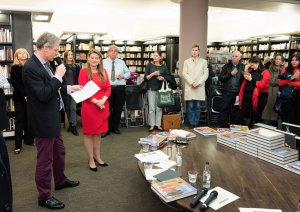 Ivan Lindsay speaking at the book launch for ‘Masterpieces of Soviet Paintings and Sculpture’ at Waterstones in Piccadilly on 10th October 2016. Indeed, the Soviet Union’s national artistic tradition forms the subject of the book. In their chapter on Soviet art from the ‘20s to the ‘50s, Natalia Alexandrova and Olga Polyanskaya frame 1917, the year of the October Revolution, as the turning-point not only (as has long been understood) from ideological and political standpoints, but in an aesthetic sense as well. Where emphasis has previously been placed on the subsuming of the Russian avant-garde by the ‘ideologically sound’, Alexandrova and Polyanskaya make a compelling case for the re-examination of those artists who took their cues from the likes of Arkhipov and the Russian Impressionists. 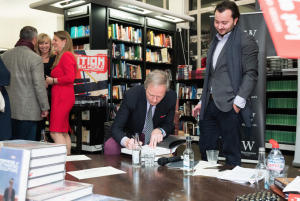 Ivan Lindsay signing books at Waterstones. Pimenov’s is an interesting case. The Lenin Prize laureate is represented here by two works, The New Moscow (1937) and Wedding on the Street of Tomorrow (1962). Both are quite delightful pieces. The former depicts a wide street in the capital city from over the shoulder of a motorist—that the figure is female is surely important—with motorcars and charabancs moving away from the viewer and into the distance in a tight arc. The street is brimming with light; pedestrians shimmer in the afternoon sun, and the apartment blocks in the far distance rise nobly into a hazy sky. The latter, however, is the more striking. A building site consisting of piled-up water pipes and rough boards is depicted against a sober grey sky dotted with cranes—a rather bleak vision, were it not for the newlyweds dressed in their finery processing toward the viewer in the centre of the picture. The work benefits from its thoughtful composition, with the negative space of the sky and apartment blocks at the top and the mud and pipes at the bottom of the picture neatly framing the central band, in which the couple seem to grow out of the wedding party like budding flowers, the woman’s gaze demurely pointing in toward her husband, who regards the viewer with contentment and confidence. This ground is far more satisfyingly covered in the book’s second half, which deals with Soviet sculpture. As an art form that naturally lent itself to public display, sculpture was seized upon with enthusiasm by the Soviet authorities, who in 1918 officially recognised its obvious propaganda value as well as its educational aspect. The short-lived but exceptionally vigorous Society of Russian Sculptors (ORS) helped smooth the way in the ‘20s and early ‘30s, and a natural tendency towards figurative styles among the then current generation of sculptors meant that the adaption to what Elena Vasilevskaya here describes, somewhat idiomatically, as ‘the new artistic situation’ was less abrupt than it might have been. Visitors leafing through the book at Waterstones. Later, restrictions began to grate against some. Emphasis was placed on the human form, and an interest in the primitive manifested itself from the ‘30s onwards, itself rooted, as in the West, in study of Egyptian and African archetypes. Even later, as sculptors found themselves strait-jacketed by consideration of how their works would scale up for public display, those who found that they were unable to conform to the norm by conviction turned to small-scale works in plastic or porcelain. In the meantime, the worker, the peasant and the revolutionary were lionised. President of the ORS from 1929, Joseph (Iosif) Chaikov (1888-1979) sculpted Marx and Liebknecht, and his four works here, Blacksmith (1927), Footballers (1928-38), Glider (1930) andMotorcyclist (1929) speak to a preoccupation with the new Soviet urbanity. Inevitably, a work of this sort entails omission; even so, it was disappointing to find absent the work of so many talented Soviet artists who took as their subject matter the kaleidoscopic world of the Soviet space programme, and that from a perspective one might well characterise as national in sentiment. As it is, this strand of Soviet art is represented by a handful of busts in the sculpture section, including Yury Chernov’s (1935-2009) famous statue of a space-suited Gagarin, and Yury Neroda’s (1920-2006) Valentina(1964), a depiction of first woman in space Valentina Tereshkova—an exceptional mixed-media piece that in another environment might have served as inspiration for Kubrick or Lucas.